← But, Doc, I’m Too Fat to Exercise! Win a Paleobetic Diet E-Book – It’s Easy! Just be one of the first 100 people to email me asking for it. Why am I giving it away? I need some feedback on it. You don’t have to be a PWD to get a copy. Perhaps you’re just a curious dietitian, nutritionist, certified diabetes educator, nurse, or physician. What do you think of the Paleobetic Diet? How could I make it better? How was your experience with the distributor, Smashwords? Would more recipes be helpful? What did you think of the sections on diabetes drugs, hypoglycemia, and exercise? If you tried it, did it affect your blood sugars? How did you feel, physically? Was your healthcare provider supportive? Did you lose any excess weight? What do you think of the food options on the diet? 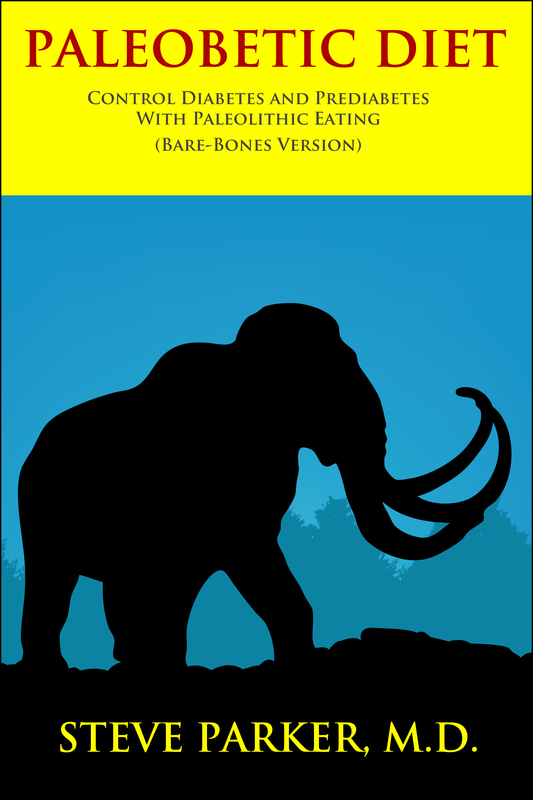 Be aware that the Paleobetic Diet e-book bare-bones version is only 9,000 words long. That’s short. It’s a how-to primer. I don’t go into evolutionary theory and the scientific underpinnings of the diet. Email a request for the e-book, to steveparkermd (at) gmail (dot) com, putting “paleobetic diet” in the subject line. I’ll email you back a coupon code that gives you a 100% discount on the e-book at Smashwords. You set up a free account at Smashwords, then act like you’re purchasing the book. Before checkout, you’ll be asked for the coupon code or discount code I gave you. Enter it. Bingo! Free e-book. You’ll get a choice of multiple e-book formats. Note that I only check my email every week or two, so don’t get in a big hurry. Thanks in advance for your thoughts! If you win the e-book and never give me feedback, I won’t bug you about it. PS: Remember, this offer is only for the first hundred people who email me. I don’t know if those copies will be gone in a few days or six months. This entry was posted in Paleobetic Diet and tagged Paleobetic Diet. Bookmark the permalink. Would be happy to read & comment ….